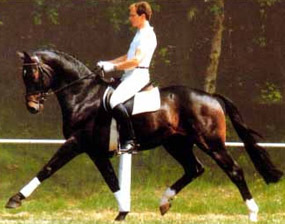 Grosso Z, bay Hanoverian Stallion, by (Goliath II Z / Furioso II) born in 1983, standing approximately 168 cm / 16.2 hands. Grosso Z is known to be a performance sire and produce versatile offspring with a very handable temperament and personality. FN Breeding indices as of 2001: Dressage 132 Jumping 139 A high percentage of his children are showing the upper levels with great success: 13 of his children made it up the levels in dressage, 28 in jumping, 17 are winning in three day events at S-level within Germany`s borderlines. Grosso Z also has some show record of his own and placed himself in dressage up to S-level and show jumping up to M-level next to his breeding carreer. Probably his most famous children so far are licensed sons Goethe and Goldfever who was born in 1991 and does well at international level in show jumping. One more licensed son Gullit was also born in 1991. Grosso Z was not exactly beloved with the Verband heads at the beginning of his carreer but always had a large fanclub who was trusting his quality and is now living on the bright side as he became well known as a sire in the meantime. His daughters inspection scores still reflect the decent dislike some of the boardmembers on one hand but also his true weakpoint which is he can somtimes throw a somewhat oldfashioned head and weak neckset. Therefor he works best with solid and well bred mares who carry some TB influence or comparable genes. He does serve as a role model for interieur and willingness to perform which can also be found in his sons. From the beginning, this stallion created a great deal of interest, in that he has not only produced a genuine international jumping star in Goldfever - but has also produced a respectable dressage stallion, Goethe. As his name indicates, Grosso Z is not only a descendant of the famed Hanoverian ?G? line, but also a product of perhaps the most famous private jumping stud of them all, Leon Melchior?s Zangersheide, in Lanaken, Belgium. Grosso Z is by Goliath II Z who was an international showjumper with Willy van der Ham. Goliath II Z is by Graf Gotthard by Gotthard, and out of the foundation mare of the Zangersheide breeding program ? Heureka by Ganeff. Heureka was actually ridden by Zangersheide founder, Leon Melchior, but it was with Hermann Schridde in the saddle that she was a star, winning the Grand Prix of Aachen. Heureka is the grand-dam of Olympic gold medallist, Ratina Z and her three stallion full-brothers, Rebel Z I, II and III. Grosso Z?s dam, Füchsin is by Furioso II out of a Lugano I mare. Füchsin was the dam of expensive auction horses as well as the licensed stallion son, Cadence Z, who competed successfully as a showjumper. We will come to Furioso and his influence later. After he won the title of Champion Stallion of Belgium, Grosso Z moved to Germany and the St Ludwig stud. One year later, Grosso Z was the Champion Stallion of the Stallion Performance test at Warendorf, scoring a sensational 148.85 ? thanks to his wonderful basic gaits, rideability and jumping ability. The Hanoverian stallion book, the Hannoveraner Jahrbuch Hengste for 2010, credits Grosso Z with 579 competitors in Germany who had won ?3,486,191 ? giving Grosso Z an FN dressage rating of 115 and a jumping rating of 123. He has a Hanoverian dressage ranking of 91, with a 122 jumping ranking. He scores 63 for type and 103 for limbs. 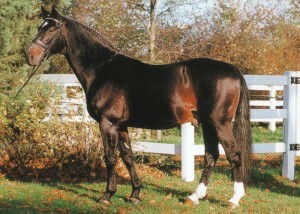 He was the sire of 306 dressage competitors (33 to S level) and 366 jumpers (62 to S level). His most successful dressage horse was Goethe, winner of ?41,153, while his top jumping earner was Goldfever with a massive ?1,997,187. He has produced a number of licensed sons including Goldfever, and Goldfever II, as well as Galippo (out of an Absatz mare) who with the new name, Gambinus, competed for Britain in the European Dressage Championships, ridden by Peter Storr.